Tips for Safe Driving on Snow and Ice and How to Drive in Snow Safely, Follow these nine simple tips, and you’ll arrive at your destination in one piece. If you live where the snow flies, you’ve seen overconfident drivers blow by you on a snowy road and wondered if—and maybe even secretly hoped—they’d end up in a ditch. Whether they did or not, one thing’s for sure: you don’t want to be that person. And you don’t have to be. Years of driving and testing cars (and winter tires) in wintry conditions have taught us that following these nine simple winter-driving rules will greatly improve your chances of arriving at your destination calm, collected, comfortable, and—most important—safe. The key to safe driving in snow is being smooth with the steering wheel, accelerator, and brakes. Why? Jerky movements with the controls easily unstick tires that have a tenuous grip on the slippery road, so every turn of the wheel, push of the brakes, and movement of the throttle must be deliberate, gentle, and gradual. Pretend there’s a cup of scalding coffee in your lap and drive so as not to spill it. The slipperier it gets, the farther down the road you should look—and think. Anticipate what you’ll need to do next. Slow way down for turns. Allow double the stopping distance when the road is wet, triple on snow, and even more on ice. Driving carefully and safely takes extra concentration. How much traction do you actually have on a snowy road? One way to know before you get into trouble is to understand what one particular small, amber, flashing light in the instrument cluster means. (It’s an outline of a car with squiggly lines behind it.) If you’re accelerating in a straight line and this light is blinking, this is the stability-control system warning you that the wheels that drive the car are slipping. Heed it. And ease up on the accelerator so the tires regain their grip. If you’re turning and see a blinking amber light, this is also the stability-control system alerting you that the car is beginning to slide from your intended path. Again, ease back on the accelerator until you are no longer applying any throttle; this allows the car to regain grip. And do not accelerate aggressively when turning tight corners in town on snowy or slushy streets. Always ease into the accelerator so that nothing untoward happens abruptly. If you feel your car beginning to skid, always, always, look where you want to go—notwhere the car is heading at that precise moment. Let your peripheral vision take care of whatever you’re trying to avoid. Racing drivers know that you almost always end up where you are looking; that’s one of the reasons they’re so good at recovering from skids. For a front-wheel skid—where the front tires lose grip and the car turns in a wider arc than you expect—ease off the gas. In a beat or two, the front tires should regain traction. Then aim where you want to go as your traction returns. For a rear-wheel skid—where the rear tires lose traction and you feel yourself beginning to spin out—quickly turn the steering wheel in the same directionthat the rear is sliding. If, say, the rear is swinging to the left, turn the wheel to the left. Ease off the accelerator and stay off the brakes. As the rear wheels regain traction, steer back in the original direction. No matter which type of skid you’re experiencing, make sure you keep your wheels pointed in the direction you want to be going. And you can gently (remember point number one) use your brakes if you think you can recover without hitting anything. If an impact is imminent, don’t be afraid to stand on the brake pedal as described in point number six. If all else fails and you need to stop as quickly as possible in snow or on ice, it’s time to engage the help of your car’s anti-lock-brake system (ABS). All new vehicles on the road today are equipped with anti-lock brakes, which use an onboard computer to optimize the car’s braking in extreme conditions. If you are in a skid from which you can’t recover or you need to avoid an obstacle—and your vehicle has ABS—push the brake pedal down hard, and don’t let up. The computer will do the rest, keeping each wheel braking as aggressively as possible based on the available traction. The amazing thing about ABS systems is that you can keep the brake pedal fully depressed while steering around obstacles; the computer will adjust the braking force at each wheel to allow you to maneuver while simultaneously slowing down. So in an emergency, don’t just jam on the brakes—keep steering! No safety system can ensure you avoid all accidents, but anti-lock brakes undoubtedly have saved many drivers from disaster. Note: most ABS systems cause the brake pedal to shudder when they activate to let you know they’re working, so don’t lift off the brakes when you feel this vibration; it’s perfectly normal. In the course of almost any snowy drive, your available traction will ebb and flow as road and weather conditions change along the route. In addition to the warning lights from the traction-control and stability-control systems, your anti-lock-brake system can help you assess how much grip you have on snow-covered roads. Here’s how: Make sure there are no cars close to you, then apply the brakes gently for a second or two while driving in a straight line. If you feel the brake pedal chattering underfoot but detect minimal deceleration, the ABS system has activated, and you can rest assured the road beneath your tires is very slick. If you can slow down at a reasonable rate without ABS activating, you’re on a more grippy surface. Once again, be sure there are no other cars around you that will be bothered by your unexpected slowing. Some anti-lock-brake systems will also flash a small amber light in the instrument cluster while ABS is working so this can be another clue to low traction when you are brake-testing for grip. Vehicles equipped with all-wheel drive or four-wheel drive can lull you into a false sense of security on slick roads. They send their power to all four wheels rather than just two, which on slippery surfaces enables impressive, slip-free acceleration, especially from rest— which can make it feel as if you have much more traction than you actually do. 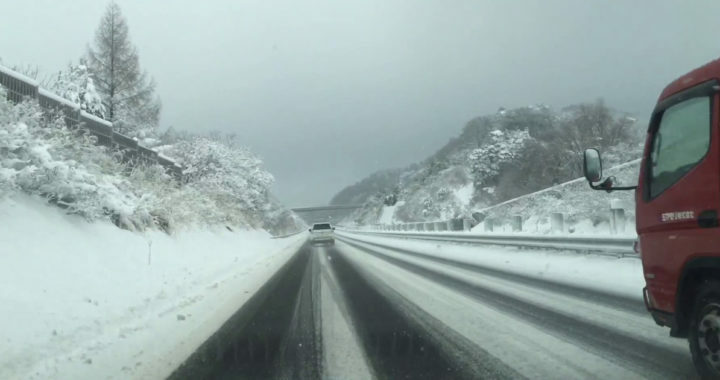 Don’t be fooled; these systems don’t in any way improve your vehicle’s ability to turn or stop in snowy conditions, so expect it to behave just like any other “normal” vehicle when you push on the brake pedal or turn the steering wheel. If you want to assess how much traction you have, you can employ the technique described in the previous step. Technically this isn’t a driving tip—it’s a survival tip. That’s because fitting a set of four winter tires (more commonly called “snow tires”) is actually the best thing you can do to improve your safety margin and reduce your anxiety level on those awful snow-covered roads. Proper winter tires provide far more traction in snow, slush, and on ice than even the best set of all-season tires. We at Car and Driver test winter tires and install them on all of our long-term vehicles. Posted in How To and tagged How to Control a Car when it is Skidding, How to control car on slippery roads?, How to Drive in Snow Safely, Tips for Safe Driving on Snow and Ice, Use Anti-Lock Brakes, Winter Tires Akron Ohio.